Droplets of metallic liquid can form new circuits on the fly. If there’s one thing that scientists absolutely should be working on, it’s a self-regenerating robo-Deadpool or the eerily-fluid T-1000 Terminator. Thankfully, a team of scientists just took an important first step towards building a robot that can keep on truckin’ even with a couple of bullet holes improve its ventilation. Okay, so maybe they weren’t working on killer robots and (probably) didn’t subject their research to gunfire, but what they did do is create a soft, flexible electronic material that can automatically repair its circuits when it gets damaged. 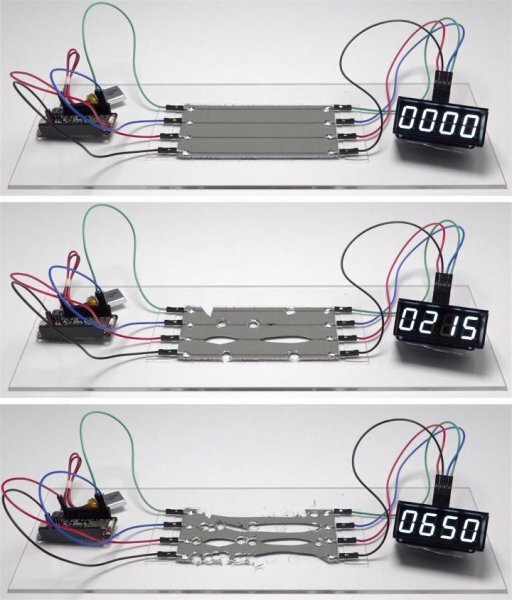 The new “skin” is made of droplets of liquid metal housed within a rubber-like material that can bend, fold, and stretch. 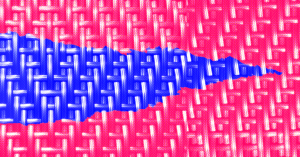 Calling it “self-repairing” is a bit of a misnomer, as the stretchy material won’t stitch itself together. But when it’s ripped, torn, or cut, the droplets burst open and create new circuits, immediately replacing those that were broken. The current is never broken, so electricity continues to flow even as the material is being damaged. The team demonstrated this immediate rerouting by continuously powering a clock while cutting away at pieces of the flexible circuitry. The team of scientists who developed the material imagines that it will help develop better robots that are based on people or other animals, and also improve interactions between people and machines. It could also lead to better wearable technology that won’t break from everyday wear and tear. “If we want to build machines that are more compatible with the human body and the natural environment, we have to start with new types of materials, Carmel Majidi, an engineer at Carnegie Mellon University who worked on the research, said in a press release. Many engineers believe that soft electronics will help revolutionize the way robots function, and also how they’re perceived in society. Flexible and durable machinery could help bring robots from the awkward, jerky movements typical of hard, inflexible bots to something more like the humanoid, smooth NS-5 androids from iRobot – at least in terms of appearance and motor control.